Maine’s logging history began in the early 1600’s when English explorers first cut trees on Monhegan Island. By 1832, Bangor had become the largest shipping port for lumber in the world; at times, as many as 3000 ships were anchored there, and it was said that a person could almost walk across ship decks from Bangor to Brewer. Over 8.7 billion (8,737,628,202, to be exact) board feet of lumber shipped from Bangor between 1832 and 1888. During this period, Patten became a booming center for logging operations. Each spring, logs harvested in the Patten area during the preceding winter were floated down the Penobscot River in massive drives to the Bangor-area mills. Circa 1820, logging camps consisted of a 20×20 camp built around a fire pit which supplied warmth and a cooking fire for the crew of 12-14 men and team of oxen. Camps were constructed without nails; they were typically constructed of large spruce logs chinked with moss and mud, with cedar shake roofs. Camps had a single “community” bed, which occupied the entire low side of the camp. It was spread with a “mattress” of pleasant-smelling balsam fir, and all of the men slept in it under one long blanket. The camp’s only sink was a hollowed log, and wet socks and clothes drying by the fire (on an aptly-named “stink pole”) gave off an indescribable fragrance. The museum houses a replica of an 1820’s camp, (minus the indscribable fragrance) for guests to explore. In later years, double camps consisted of a cooking area separated from the bunk house by a “dingle,” which was used to store the camp’s grindstone and barrels of cod fish, salt pork, bully beef, and sometimes flour. 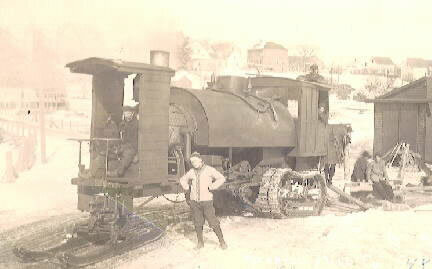 The museum also features a double camp, which visitors can explore.The Lombard Steam Hauler, seen below, was designed and engineered in Waterville by Alvin Orlando Lombard, a local blacksmith. It was patented in May of 1901, and it is now featured in the mechanical engineering hall of fame! The Patten Lumbermen’s Museum was founded in 1963 by Lore Rogers and Caleb Scribner. The Museum documents Maine Logging History by preserving the logging heritage and accomplishments of early inhabitants of the state of Maine. The museum houses some of Maine’s most notable contributions to the early mechanization of logging, including the Lombard Steam Hauler, Lombard Gas Hauler, and the Peavey Cant Dog. Through its diversified primary investment portfolio, MaineCF offers nonprofit organizations access to institutional investment strategies and management normally available only to large investors. The foundation employs multiple professional investment managers with experience in specialized sectors of the investment markets and has been partnering with donors and nonprofits to build strong communities in Maine since 1983. For more information, visit www.mainecf.org or call 1-877-700-6800.